Back in July AMD announced the Radeon Pro WX series. 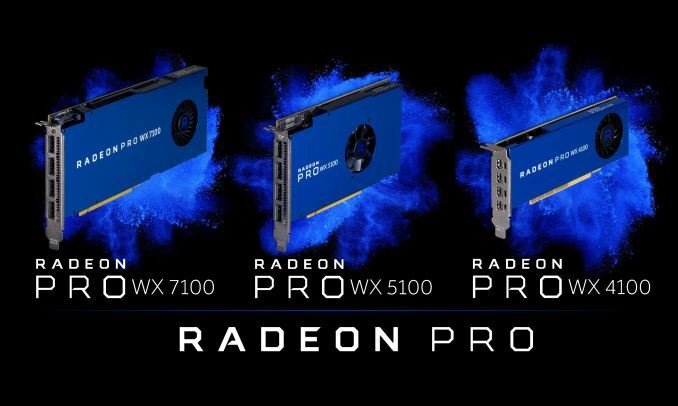 Part of a broader rebranding effort for AMD’s professional grade graphics cards – moving away from the FirePro brand and making everything part of the Radeon family – the WX series would also mark the first use of AMD’s latest-generation Polaris architecture in their pro cards. At the time of their announcement, AMD had not finalized the card specifications or launch date beyond Q4, but as of this week the cards are finally reaching AMD’s partners and retailers, and the final specifications are being released. Memory Clock ? 5Gbps GDDR5 ? ? When AMD first announced these cards, they were targeting better than 2 TFLOPS, 4 TFLOPS, and 5 TFLOPS for the WX 4100, WX 5100, and WX 7100 respectively. The final specifications put the WX 7100 and WX 4100 ahead of that, at 5.7 and 2.4 TFLOPS. However the WX 5100 ended up coming up a bit short of AMD’s goal; it tops out at 3.9 TFLOPS. Otherwise the cards have not significantly changed since AMD’s initial unveiling. Though along with the final specifications, we also have the final TBPs. The top-tier WX 7100 is rated for 130W, while the WX 5100 becomes AMD’s pro card of choice for 75W systems that don’t offer an external power connection. Finally the low-end WX 4100 is being rated at 50W. Meanwhile AMD is going for a single-wide cards across the entire family, something they also did with the 150W-and-below members of the previous-generation FirePro series. Finally, when it comes to pricing AMD indicated that they’d continue to be very competitive with NVIDIA here, and the final prices reflect that. The WX 7100 will be hitting the market at $799, with the WX 5100 and WX 4100 bringing up the rear at $499 and $399 respectively. AMD has over the last couple of generations aimed to offer better performance-per-dollar than NVIDIA in this space, and the Radeon Pro WX series is continuing this tradition. The high-end WX 7100 and low-end WX 4100 will be available later this week on the 10th, while the mid-range WX 5100 will hit the virtual shelves later next week on the 18th. Along with this week’s launch of the Radeon Pro WX series cards, AMD is also further clarifying their plans for software support of the new hardware. Even with the change in branding, the Radeon Pro WX series is still getting its own, separate enterprise driver release. 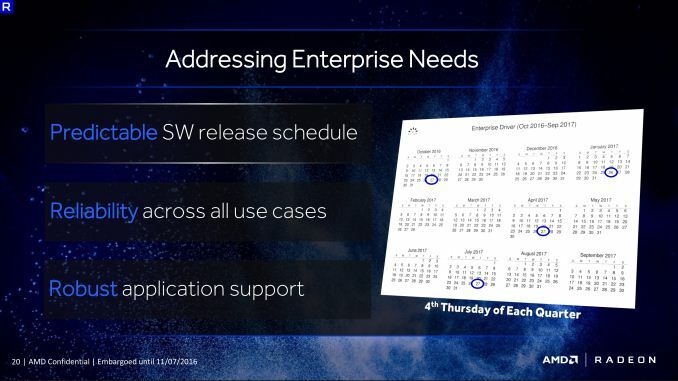 The biggest shift here is that AMD is now going to be releasing drivers on a set schedule; they will be releasing drivers quarterly, on the fourth Thursday of each quarter. In fact this new schedule is being applied to all AMD pro cards, including their existing FirePro cards, with their most recent driver release on October 27th (driver 16.Q4) serving as the first release under this schedule. AMD hopes that by offering drivers on a fixed release schedule, they can strike a balance between updates and stability for pro users, giving pro users regular updates while avoiding the disarray that can come from unexpected driver releases. 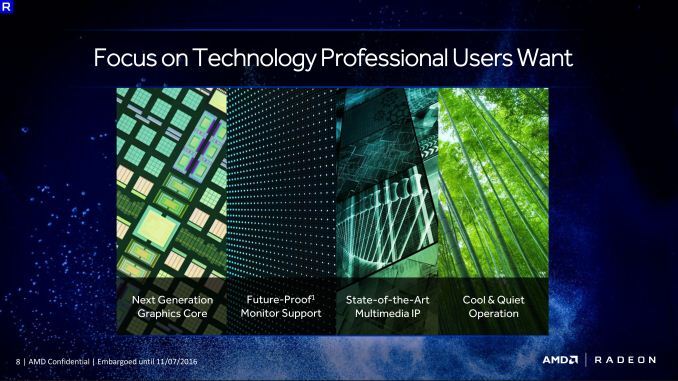 AMD is also reiterating their focus on reliability and driver quality. 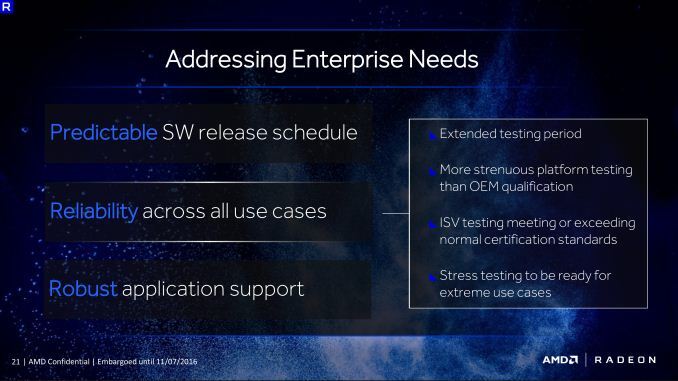 Besides getting drivers certified by the usual parties in the pro application space – Autodesk, Adobe, Dassault Systèmes, etc – they are also doing their own internal testing, the idea being to exceed what their OEM partners are already doing. From a market share perspective AMD is still the underdog by a significant margin, so it's important they show potential customers that they can meet or beat NVIDIA on support and reliability, as well as performance.